If only I could walk away from Pinterest more often. This is what happened when I forced myself to leave the computer today. 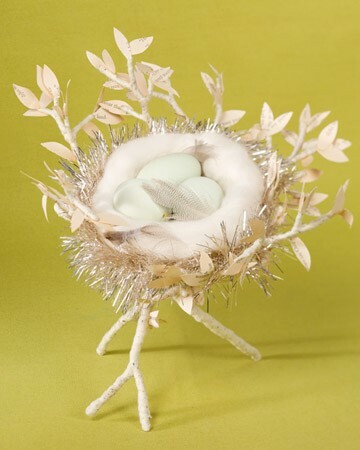 I had a handmade pine needle nest, a few turquoise eggs and some moss already in my craft stash, so it was off to the woods to find a few small branches. Once I chose three branches and cut them to the length I liked, I wired them together with green floral wire. Then I hot glued the branches together under the wire and glued moss around the wire to cover it. 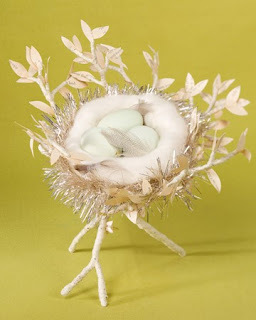 I also hot glued the nest in place between the three branches and added a little moss, faux leaves and spring flowers. So here's my rustic version. What do you think?